One father. Two brothers. Two great religions. One mutually hallowed patch of ground. For centuries both have called it home. Now they bitterly contest whose nation it shall be. 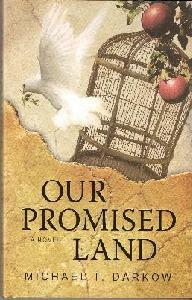 Part history, part fiction, Our Promised Land challenges the reader to walk this long sad journey in the shoes of both sides. The characters are gut wrenchingly real, the events too tragic to bear, precisely because they are as historical as they are fictional. Can there ever be peace by any other path, except to admit the humanity of both sides, each finally granting the other this appropriate and proper dignity? Our Promised Land compels the reader to face the unspeakable monstrousness of the violence, its very human perpetrators on both sides. Yet it refuses to deny the humanity of either. Our Promised Land begs for that far better world we of every race, every nation, every religion, and every ideology hope, dream, and yearn, the one that finally and at long and terrible last is expressive of our intelligence, our dignity, and our nobility, no longer our worst instincts. Can it ever be "the" Promised Land for either side, except that intelligence, dignity, and nobility confess, it cannot be only one side's, but it has always been both sides', Our Promised Land?